A practical nearfield monitoring choice - if you're up for a three-way, these won't disappoint. Good bass response. Switchable EQ. Reasonable price. There are cheaper options available, but these do enough to justify their price tag. 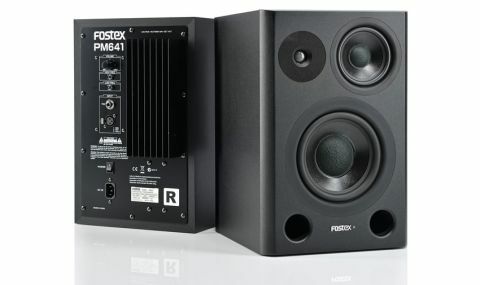 After seeing its range of two-way monitors finding happy homes in many studios, Fostex brought out its first three-way powered monitor, the PM841 - which was characterised by an eight-inch woofer driven by a 60W amp. Now it's brought out a second, the smaller PM641 featuring a 6.5-inch woofer taking its power from a 50 watt amp. It also has a four-inch mid-range driver with an 18 watt amp, and a 3/4 inch silk dome tweeter, also with 18 watts of power. "In a three-way monitor the separate mid-range driver is there to specifically reproduce those crucial middle frequencies"
Several manufacturers make three-way monitors, but for nearfield monitoring the two-way design is more common, so why go for a three-way? Well, two-ways feature a woofer and a tweeter - the tweeter handles the top-end while the woofer takes care of the low, with both handling the mid-range frequencies that they are best able to reproduce, determined by a crossover that splits the frequencies between the two. In a three-way monitor the separate mid-range driver is there to specifically reproduce those crucial middle frequencies so it can provide a more accurate mid-range response. Sold as a pair, you get clearly marked Left and Right monitors in the box. With a smart matt-black finish and curved edges on the front baffle, the PM641 has the mid-range driver and tweeter sitting next to each other on a horizontal axis above the woofer, which serves to minimize the physical height of the enclosure boxes, making them a nice size for a nearfield monitor. They're not too bulky that they would dwarf a setup in a smaller-sized room, yet they're substantial enough to comfortably house the drivers, and they look like they mean business! The woofer and the mid-range are housed in individual chambers inside the enclosure box to minimise interference between the drivers. Below the woofer is a pair of bass ports separated by the Fostex logo and a bright blue LED to show that the monitors are powered up. The rear of each cabinet is dominated by a large finned heat-sink adjacent to the connection sockets, which are an XLR and a 1/4" TRS jack. Besides the on/off switch, there is a pair of three-way switches to change the response from flat. You can have a subtle boost or a cut of 1dB in the high-end at around 10kHz and/or a boost or cut of 3dB to tweak the low-end response at around 60Hz - the cut being useful if you have to place the monitors in corner positions. The volume is set by a rotary knob which has solidly-detented positions for matching left and right monitor levels. First impressions are of a nicely- balanced sound across the frequency range, each of the three drivers seemingly doing their optimum - Fostex says that the built-in channel divider provides ideally overlapped frequency crossovers for the smoothest connections. The bass-end is impressive and kick drums come fat and rounded. There's enough weight to keep you well-informed about your bottom-end and plenty of mid and top detail too. We'd probably describe the mids and top as smooth - there's no hype or harshness here - and it feels like you could use these on long sessions without fatigue. There are many choices when it comes to nearfield monitors and deciding which are right for you can be daunting. The PM641s might cost more than some of the budget options, but just shy of £400 is not a bad price to pay for a nicely practical three-way monitoring system.